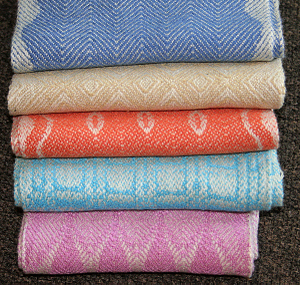 I have a small collection of interesting jacquard-woven cotton dishtowels, which I love to use. 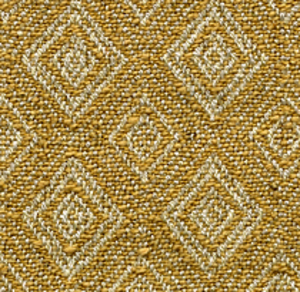 They are woven in mills in France and Italy, and are a veritable encyclopedia of weave structures. 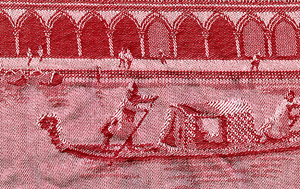 Here is one of my favorites - it depicts a Venetian scene, complete with canals, bridges, and at least nine gondoliers, and was woven in France. The first image is scanned at life size, and the second at 16x magnification. Click to see full size. The designer has included satins, twills, birdseyes, basket weaves, crepes, and a number of other structures, to come up with a generous tonal palette from a one-color warp, one-color weft fabric. I can't tell whether the warp is natural and the weft red, or vice versa, because the towel is hemmed on all four sides, so there is no visible selvedge to give me a clue. 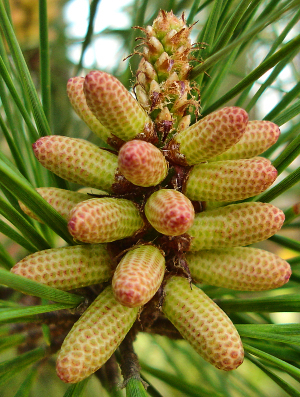 I pass this tree every day on my walk. This is what it looked like last Wednesday, and I am actually posting this on Friday, to appear on Sunday (are you still with me? ), at which time it will be totally different from what you see here. My neighborhood is at the season when things change fast. I can only describe this furious energy as an explosion of life. I know it will happen every year, but it still takes my breath away each time. This scarf, from the set I cut off a couple of days ago, has a very modest and conservative appearance at lifesize. The section I have scanned could have been woven on a point twill threadingon 20 shafts. 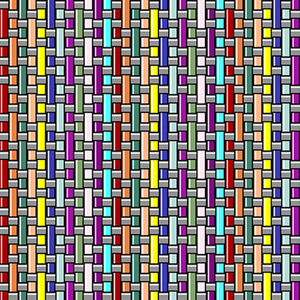 The weft sequence repeats in 78 picks. It gets exciting when magnified 25x. The warp is bamboo (Bambu12 @ 6300 yds/lb), and the weft is a fine silk bouclé of similar grist. 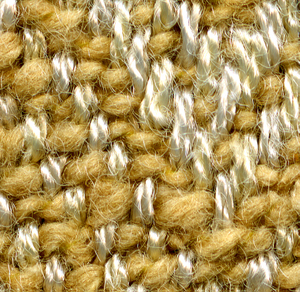 The bamboo is so shiny that the highlights of the scan are burned out, but you can clearly see the structure of the yarn - it is two loosely twisted strands of 2-ply yarn. The texture of the natural silk tussah bouclé contrasts effectively with the warp, even though the tonal values are close. 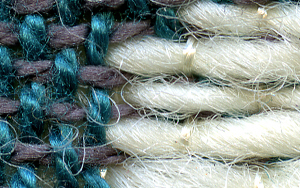 And note the extra-long weft floats at the turning points of the twill - these are practically invisible at lifesize, but are apparent at high magnification. But I must say–when I am wearing this scarf, I hope only very close friends get close enough to see the floats. 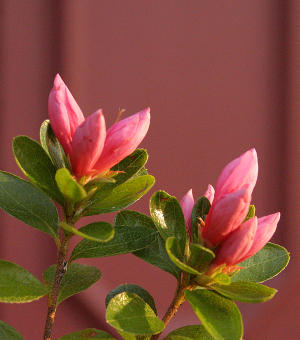 When we purchased our house 35 years ago, the property came with 300 well-established and thriving azalea bushes. I'm no gardener, and had no idea about how to care for these plants. The first year they bloomed extravagantly. I thought they'd do even better if I fertilized them, so the second year I did just that, and guess what - no blooms. Lesson learned: leave the darned things alone, which is what I have done ever since. And every year they reward me with this gorgeousness. I took the photo yesterday morning, at first light. Early morning and late afternoon are especially good times for photography, as the light is mellow and warm, and there are no harsh shadows as there would be in the glare of midday. I used a relatively large aperture and telephoto setting, so that the house shutters in the background are blurred out. Putting John Barleycorn aside, the vital statistics of the scarves are as follows: warp is bamboo at 32 epi in a point draw variant on 40 shafts, wefts are silk (beige), rayon (pink) and bamboo (blue, aqua, and orange). Cloth structures are straight and broken 4-end twills. Bonnie posted an interesting comment about yesterday's double weave sample - she points out that there is a longish weft float visible, and she is quite right. What to do about longish (technical term!) floats is a matter of some argument among weavers. My personal feeling is that what length floats you allow depends largely on the yarn, sett, design, and intended use of the fabric. In dobby fabric for 8-shaft and lesser looms, the design areas are of necessity smaller, and long floats are intrusive. For 16 shafts and above, and in jacquard designs, larger design areas are possible and the longer floats don't seem to jump out and offend the eye as much. In any case, sampling is always in order, and will tell you what you need to know about floats, their aesthetic properties, and their wearability. If for a given fabric you choose weaves which are inclusive of each other, the float problem doesn't arise at all, but for double weave inclusivity is not an option. 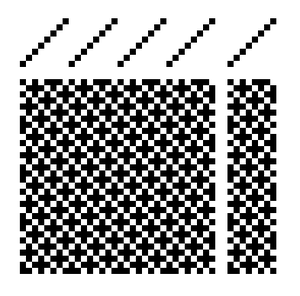 Bhakti Ziek, co-author of The Woven Pixel, suggests the use of a fine line (2 pixels wide) of plain weave around design areas, to separate them and control the float length where two different non-inclusive weaves come together. That's a handy trick to know for both dobby and jacquard design. 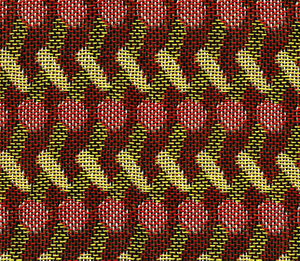 This sample represents a foray into double weave in which two warp colors (black and white) alternate end and end, and two other colors (red and yellow) alternate pick and pick in the weft. 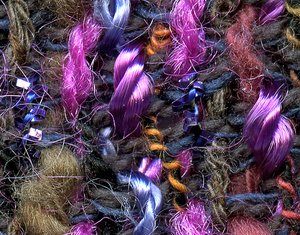 This produces four possible color blends, any of which can appear on the face of the cloth, with the remaining yarn colors going to the back. 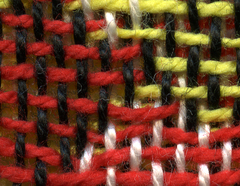 The white warp can weave with the red or yellow wefts, and the black warp can do likewise. The weave structure is double plain weave, and the threading is straight draw on 24 shafts. The design was created in Photoshop in four colors, each color being assigned its own doubleweave variant. Fabric details: sett 30 epi and ppi, all yarns 10/2 mercerized cotton. Click on images to enlarge. Today's lampas is pretty basic. 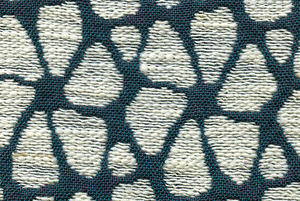 The ground and the pattern are both plain weave. The layers are untied (pocketed) where ground rises above pattern. Ratio of ground warps to pattern warps is 2/1. Warp sett is 30 epi. Weft rotation is ground, pattern, repeat. Ground warp and weft are 10/2 mercerized cotton, green for warp and medium gray for weft. Pattern warp is polyester machine embroidery thread, pale gray, and pattern weft is handspun natural wool singles (Finn sheep, if I remember correctly). You can still see some of the VM (vegetable matter) in the wool! Thanks to all for the birthday wishes. It was a wonderful celebration. I think I consumed my annual quota of jellybeans in one day. Today's my birthday, so I'm taking the day off. 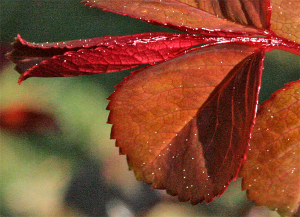 But here's a present for all of you - the new leaves on a climbing rosebush in my back yard, by early morning light yesterday. The latest edition of the Damask Network Newsletter just arrived, and I found the article on woven damask and damask knives to be absolutely fascinating. This contribution, by Marij Kornet, provides an intriguing glimpse into the layering process of producing the intricately patterned Damascus steel knives. The newsletter is for members of the Damask Network only, but this group has a website full of good information. It is worth looking at for the pictures alone, and also has information on membership if you are willing to contribute your expertise to the group. The layering/distortion idea suggested a direction to follow in Photoshop, for a possible jacquard design. 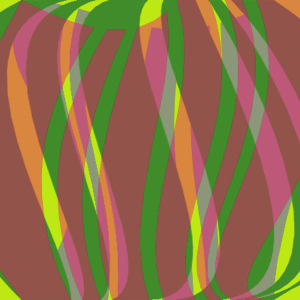 First I drew a simple black and white striped design, then copied it onto three successive layers, coloring each one differently, and distorting each in turn with the warp tool (Edit>transform>warp). I dialed back the opacity of each layer to approximately 50%, colored the background yellow, and flattened the file. This has possibilities! My thanks to the Damask Network for directing me onto this path. There have been many mixed warps in my weaving life. These warps are sometimes inelegantly termed "garbage warps," because they're a good way of using up odds & ends of yarn, but in this era of recycling-consciousness, they perhaps deserve a better name. In any case, the way I wind them is to hold three or four yarns at a time loosely in my hand, separated only by my fingers, and wind them together on the warping board, working in a group as they form a cross. Then at threading time, I select them at random within each group, hit or miss. Note that this only works if you warp from back to front, beaming the warp through a raddle, then threading the heddles, then sleying the reed. 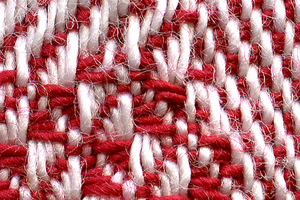 The draft was created with ProWeave, and the fabric simulation was done with Fiberworks PCW. My favorite threading for these mixed warps is a straight draw on 8 shafts, with a lift plan based on plain weave, with extra risers inserted in satin order. This tends to highlight interesting warp yarns in a random manner, the randomness coming from the selection of the warp threads compounded by the satin order of the liftplan. It is unlikely that any noticeable repeat will arise from this arrangement. These fabrics should be sett a trifle closer than for plain weave. 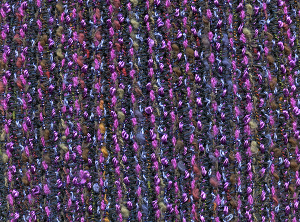 Here's a scan of such a mixed fabric, with a warp of plied rayon, handspun wool boucle, and other novelty yarns, and a weft of two gray cottons wound together on the bobbin. The set is 10 epi, and the fabric is shown in actual size and in a greatly magnified scan. Click on images to view full size.